Bangkok – Recently, Bangkok Ariways Public Company Limited has been awarded “Travelers’ Choice Awards – Regional Airline Asia 2019” from TripAdvisor, the world’s largest travel site. TripAdvisor’s Travelers’ Choice Awards are based on reviews by global travelers that focus on service, quality and value. 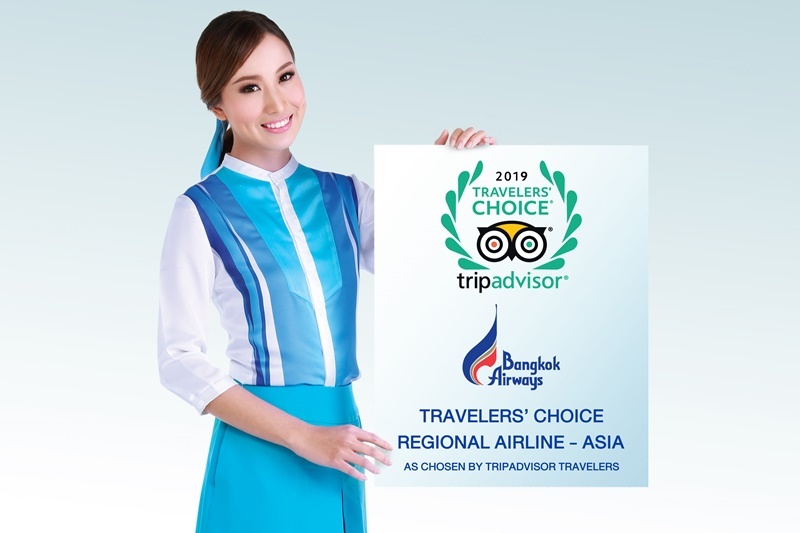 Mr.Puttipong Prasarttong-Osoth, Bangkok Airways’ President commented “On behalf of everyone at Bangkok Airways, we are proud and honored to be recognized as one of the winners of Travelers’ Choice Regional Airline Asia for 2019 Traveler’s Choice Awards by TripAdvisor for the second year running since 2018. The award means our commitment and dedication to deliver best experience and personalized services to our customers under the slogan “Asia’s Boutique Airline”. “I would like to also thank all the reviews and comments that were provided on TripAdvisor making Bangkok Airways your choice of airline in the category. This means a great deal for us to continue to maintain highest service quality and deliver the best to our passengers” added Puttipong. TripAdvisor is the world’s largest travel site, enabling travelers to unleash the potential of every trip. TripAdvisor uses an algorithm that accounts for the quantity and quality of airline reviews and ratings over a 12-month period (January – December 2018) to determine the award recipients.